Shining Wisdom was the first game in the Shining series for the Sega Saturn. Previous entries in the series, the first being Shining in the Darkness, were made for the Sega Genesis and Sega CD. 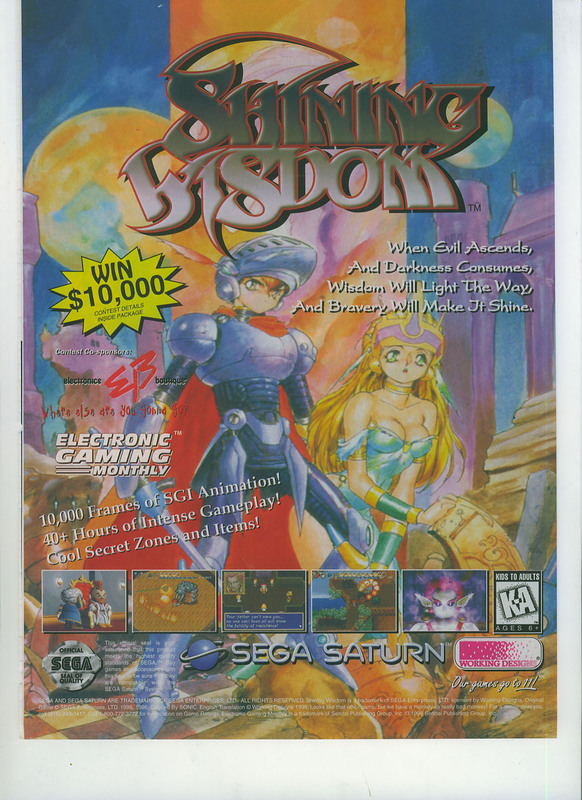 Shining Wisdom was also intended for the Genesis or Sega CD but at the last minute it was decided to develop it for the Saturn instead. Unfortunately, this was a hurried change and it shows as the graphics are really not up to the standards of a 32-bit system like the Saturn. The Shining series started life as a turn based role-playing game. Shining Wisdom was the first in the series to be an action RPG, similar to the Zelda series. Personally, I prefer the turn-based approach. It was translated and released by Working Designs in the U.S. and while not a terrible game by any means, it is not one of their better releases or one of the better games in the series. To date, the 1996 Sega Saturn release is the only version of this game available. The above ad is from the October 1996 issue of Electronic Gaming Monthly.